In exquisite poetic language, author and illustrator Caroline Magerl tells the story of a girl who finds a shivering wet stray cat on the roof, befriends it with sardines and then kindly tries to find where it belongs. Maya visits many homes that feature rabbits, dogs and other cats in their multitudes while Cat looks on somewhat perplexed. 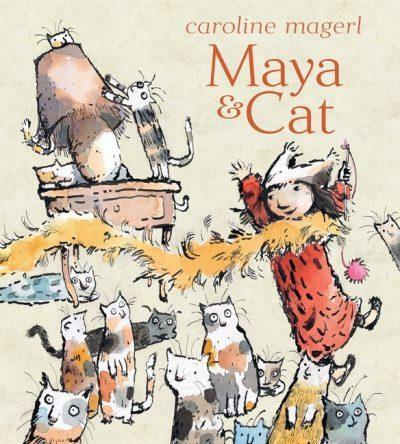 Cat eventually leads the way and Maya is given a wonderful surprise when she finally discovers Cat’s true home. Maya is a quirky character trailing her feather boa and wearing a hat that looks remarkably like the ears of Cat. The ink and watercolour drawings are just beautiful and the faces on the characters so expressive and humorous. This is a delightful picture book for all animal lovers that will be pored over by children aged three and up. Angela Crocombe is the shop mananger at Readings Kids.